Office for Metropolitan Architecture have won a competition to design a new city hall for Rotterdam in the Netherlands. Called Rotterdam’s Stadskantoor, the project will include municipal functions, offices and apartments. 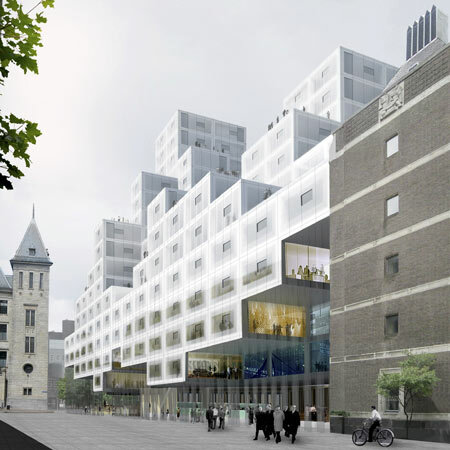 The building will be made up of smaller box-shaped cells. Gardens for the apartments will be located on the higher roof terraces. More about OMA on Dezeen in our special category. The Office for Metropolitan Architecture (OMA), in collaboration with Werner Sobek and engineers ABT, has won the competition for Rotterdam's Stadskantoor, a new building for the city hall that will accommodate municipal services, offices, and residential units. The winner was announced this morning by city alderman Hamit Karakus. OMA conceived a modular building with repeated units gradually set back from the street as they rise into two irregular peaks. The building’s composition of smaller cells creates an impressive, complex form when viewed from Coolsingel, one of Rotterdam’s main arteries, and allows for subtlety and adaptability as the Stadskantoor abuts the adjacent municipal building from the 1950s, the Stadstimmerhuis. The Stadskantoor's innovative structural system generates maximum efficiency and versatility both in construction and in program: units can be added or even dismounted from the structure as demands on the building change over time, and can adapt to either office space or residential parameters as desired. Green terraces on higher levels provide the possibility of an apartment with a garden in the heart of urban Rotterdam. The building's concept of flexibility – together with a climate regulated by warm air stored in summer and released in winter, and vice versa, and the use of hi-tech translucent insulation in the building's glass façade – allowed OMA to meet the design brief’s requirement of making the Stadskantoor the most sustainable building in the Netherlands. Reinier de Graaf commented: "Rather than posing as the city's next superlative, the design for the Stadskantoor is partly a building, partly an urban condition – a skyline in its own right. The design attempts to mediate between the adjacent town hall, post office and Stadstimmerhuis. Through an intentional ambiguity, the mass immerses itself in the city's diverse architectural periods, absorbing the scales and styles of its immediate context."